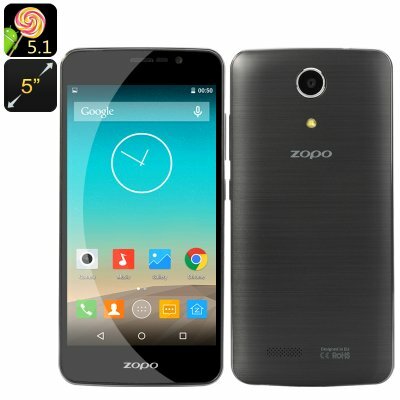 Successfully Added Zopo HERO 1 Smartphone - 5 Inch HD GFF Screen, MT6735 Quad-Core CPU, Android 5.1, 2GB RAM+16GB ROM (Black) to your Shopping Cart. Hero 1 comes from China’s famous smartphone manufacturer, Zopo. The company has already offered an array of best selling models for the market and the Zopo Hero 1 follows a successful line of beautiful devices. The Zopo Hero 1 is a beautiful device with a sleek design and a 5 inch HD screen. Made in classic black, it’s an elegant phone with lots of media functionality. Thanks to GFF technology (glass film film), the phone offers enhanced sensitive touch experience. The screen is of optimal size - guaranteeing great viewing experience when watching videos, browsing the web, working with apps and more. At the same time, the screen makes the phone portable and convenient to operate with one hand. The Zopo Hero 1 comes with Android 5.1 and lets you get all the apps you may need from the Play Store. Smart Wake and Gesture Sensing make interacting with the phone even more intuitive and the quad core processor ensures smooth operation and seamless multitasking. Zopo’s Hero 1 also features great connectivity, covering a wide range of networks: 2G: GSM 850/900/1800/1900MHz, 3G: WCDMA 900/1900/2100MHz, 4G: FDD 800/1800/2600MHz and coming with two SIM card slots. The phone comes with a 2500mAh battery, offering up to 10 hours of continuous talk time and 120 hours on standby. With sleek design, a great set of features and strong media capabilities, Hero 1 is a strong value-for-money choice. The ZOPO HERO 1 Smartphone comes with a 12 months warranty. Brought to you by the leader in electronic devices as well as wholesale Android smartphones..